If you love your fruit but always thought you needed a large space to grow your own, think again. Dwarf fruit trees could be the solution to your problem of growing food in a small space or making your garden more productive. Dwarf fruit trees provide earlier yields in smaller spaces, and can even be grown in large containers. They bear fruit sooner than standard fruit trees, usually within two years. Dwarf fruit trees also look good, with a compact form that bears normal-sized fruit. They generally reach 2 – 2½m in height. Not only do dwarf fruit trees make using a small space feasible, they can make a larger space more productive. Instead of planting a full size apple tree, you can plant 3-4 dwarf trees in the same space. You can grow a wider selection of fruit by planting more tree varieties into the garden space you have. Dwarf fruit trees are either genetically natural dwarfs or regular fruit trees grafted onto dwarf rootstock. These days even many commercial apple orchards are tending towards dwarf fruit trees due to the ease of harvest and increased productivity. Dwarf fruit trees have a reputation for being short-lived, but many experienced gardeners think this undeserved. It can probably be attributed to dwarf fruit trees being shallow-rooted, and therefore more vulnerable to water shortage. Take care of your dwarf fruit tree and it is capable of living a long life. Dwarf fruit trees are a great food source alternative for those that are restricted to container gardening. In containers you can provide your dwarf fruit tree with the ideal soil environment, turn it to give the whole plant plenty of sunshine and vary its location to suit the season. Dwarf fruit trees can be under-planted with salad greens to increase the productivity of your container. Use large containers or half-barrels. Buy trees bare-rooted in winter while they’re dormant. If you’re only planting a single tree be sure to select a self-pollinating variety. Two trees that cross-pollinate can be successfully planted in a single hole using the duo method. Check growing conditions in your area. 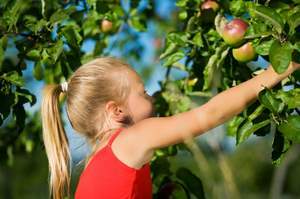 It’s a good idea to check with neighbours to find out what fruit tree varieties are growing well for them. Choose a sunny and well-drained position with shelter from the wind if possible. 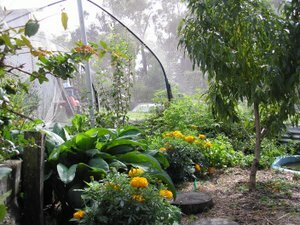 Check that there is a good water supply and the site is free of interfering roots, especially eucalypts. Plant trees in rich soil and mix in well broken down compost, but never fertiliser. Don’t add fertiliser until late winter when the tree begins to emerge from dormancy. Many propagators recommend preparing the hole about 6 months in advance. Dig about 50cm deep and fill with garden clippings and kitchen scraps that will compost into healthy soil filled with welcoming worms by the time you’re ready to plant. Plant trees at least 1.5m apart (preferably 2m apart) and with 2m between rows. Ideally the minimum space the tree should have is 2 ½ m in diameter. Closer planting is possible but will further restrict growth. Dig a hole about 50cm deep, then add some soil back in to form a mound. Position the root ball of your dwarf fruit tree on the mound so that the graft union will be about 10cm above the ground. Planting the graft union beneath ground level can result in the top of the tree forming roots resulting in a standard sized tree. Fill around the tree with soil. Firm down the soil and water in to remove air bubbles from around the roots. Mulch and keep weed-free. Be careful to protect young trees against nibbling wildlife. Keep the soil around dwarf fruit trees moist. Dwarf fruit trees need to be fed and watered regularly, especially trees in containers. Fertilise with water-soluble fertiliser when Spring growth begins, and again in early Summer. Several plant nurseries recommend applying a slow release fertiliser. Monitor water carefully from late Spring to early Autumn when the months are dryer.